Harris Kia is a full-service dealership. Visit us for all of your maintenance needs. Schedule an oil change with us today! One of the most important things you can do to ensure your vehicle stays in tip-top condition is to schedule regular oil changes. Fresh oil means that your vehicle will run more smoothly, and that it will stay in its best shape longer. More so, you will create less-harmful emissions when you get your oil changed regularly. Old and dirty oil causes an excess of noxious engine emissions, while fresh oil is less likely to burn, and it's better able to absorb particles. Of course, one of the most important reasons to get your oil changed is because clean oil helps to keep the internal moving parts of your engine clean and lubricated, resulting in a smoother, quieter ride. It will help to keep dirt and particles out of your engine and protect it against damage. Kia Canada awarded Harris Kia with the prestigious Platinum Award. Our Harris Kia certified pre-owned vehicles have been through meticulous inspection procedures, to ensure the highest quality and peace of mind for our customers. Book your appointment with us at Harris Kia today, and get on the right track with your auto maintenance. You can easily book online, just click the link above to make your appointment. At Harris Kia, we provide quick and efficient service, and we are always on time. As a bonus, if you sign up to be a Kia Rewards Member you can earn points on every dollar you spend on services including, but not limited to oil changes. It pays to shop at Harris Kia, become a member and reap the rewards today. Harris Kia is a friendly, family operated dealership and a proud member of the Harris Auto Group since 1964! We have won numerous accolades including "Dealer of the Year" four years in a row from DealerRater.ca as well as very high customer satisfaction scores including the prestigious "Platinum Dealer" award from Kia Canada. We work hard to earn and keep your trust, which is how we have created such lasting ties in our community. We have a dedicated and knowledgeable team across all departments at Harris Kia. Our team members are eager to help you find the best car or service to meet your needs and exceed your expectations. Feel free to browse our inventory online, request more information about vehicles, schedule a test drive, or inquire about financing. 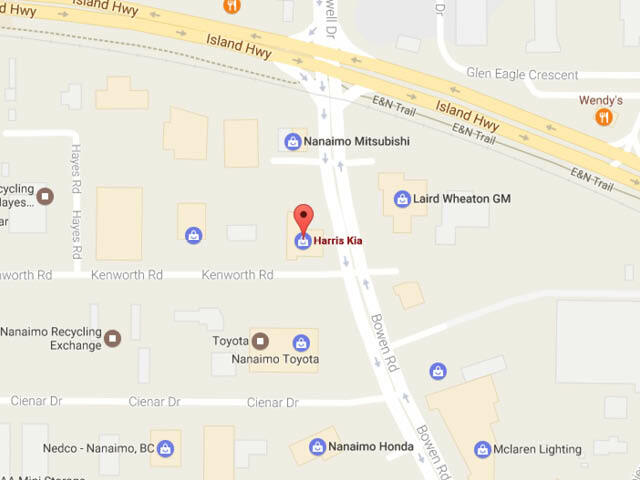 We are conveniently located at 2575 Bowen Road in Nanaimo BC. Give us a call toll free at 1 (866) 796 5209 to speak with us today! "Best experience ever at a car dealership." I want to say a few words about Harris Kia in Nanaimo. We were met by Cameron Adams in a very friendly manner who made every effort to find out what we were looking for. Cameron and the rest of the staff made us feel at home and relaxed...We were looking for a Kia Soul and Cameron got into the car with us and explained all of its features. We then took a test drive on our own. By the time we left the dealership we felt like we were part of their family. I have never been treated better than this at a car dealership. This group is outstanding. "Customer Service" is their motto"
My mother bought a 2015 Soul and after her first servicing I was amazed at how wonderful the staff were. Your Appointment is "your" time, not 15 - 25 minutes later. They wash and vacuum your vehicle each time. I have now moved all my car servicing to Harris Kia because of their wonderful customer care and service. I never experienced this at Duncan Toyota. The cost of the service was also cheaper than Duncan Toyota. Unbelievable! Doug is also a bonus as he will shuttle you wherever you want to go. Always a wonderful experience. As a result, we will be purchasing our new vehicle at Harris Kia. 5 stars to you!! "In looove with my new car!"